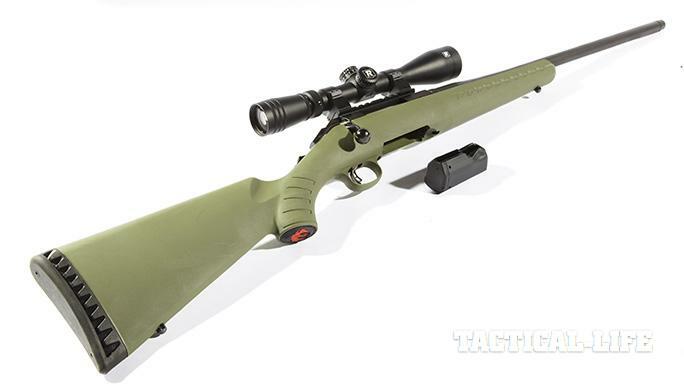 Ruger strikes again with the Ruger American Predator: a 1,000-yard, multi-mission bolt-action rifle available for less than $600. 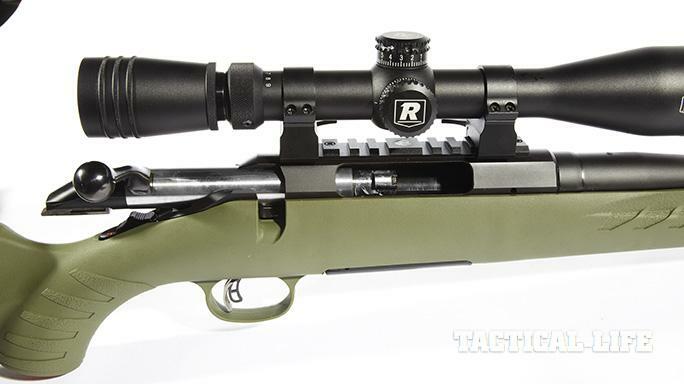 Pairing Ruger’s new 6.5 Creedmoor Predator bolt action with a Redfield Revolution/TAC scope creates a sub-MOA package that costs less than $900. What’s not to like? 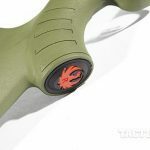 The rifle’s lightweight synthetic stock comes with a thick rubber buttpad to help absorb felt recoil, and the trigger is adjustable from 3 to 5 pounds. 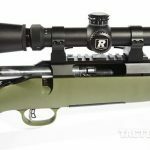 The one-piece, three-lug bolt easily clears scopes with its 70-degree throw, and Ruger’s Power Bedding keeps the action in place while allowing the barrel to float freely. 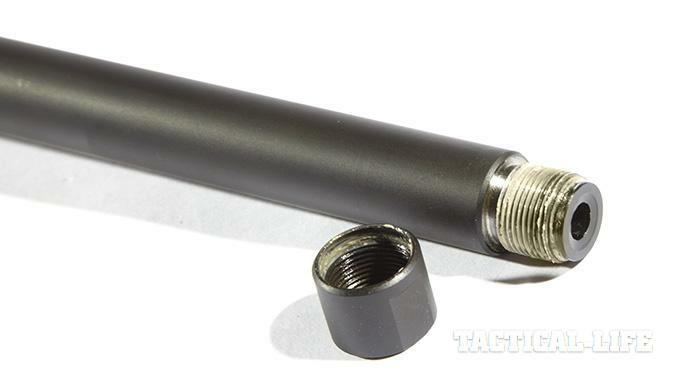 The 22-inch-long barrel sports 5/8×24-tpi threading, and Ruger includes a thread protector. 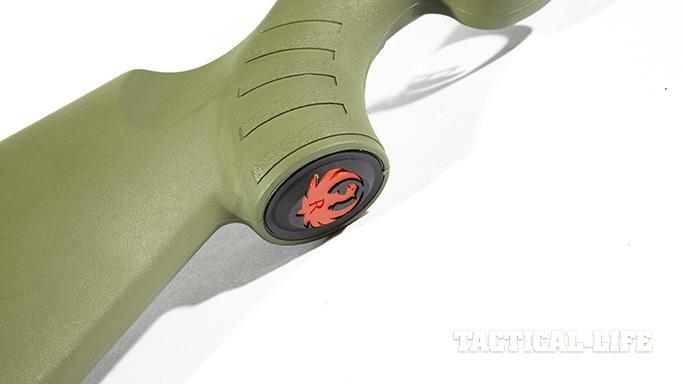 The green stock features texturing on the grip for a sure hold, and note the Ruger logo. 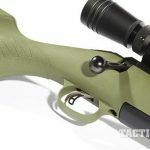 The Predator in 6.5 Creedmoor comes with a black, four-round rotary magazine that fits flush with the bottom of the moss green stock and provides a nice contrast. 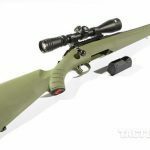 Mention precision rifles, and most of us will immediately think of a factory-customized AR or bolt-action rifle that weighs 11 to 13 pounds with a scope. 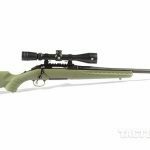 These rifles often have excellent accuracy and equally “excellent” prices, starting at about $900 for a basic bolt gun and easily topping $2,500. Add a $2,000 scope and a few accessories, and the cost is higher than many law enforcement agencies will pay. Long-range hunters also have problems with these big, heavy bolt guns. Whether you sit in a blind overlooking an Eastern beanfield or hunt in the high mountain country of the West, you’ll want a rugged rifle that doesn’t weigh a ton. It didn’t take too many hours for my arms to get weary carrying a full-sized sporter in Arizona or holding one in the ready position while sitting in Virginia deer blinds. I quickly learned to pack a lightweight rifle. 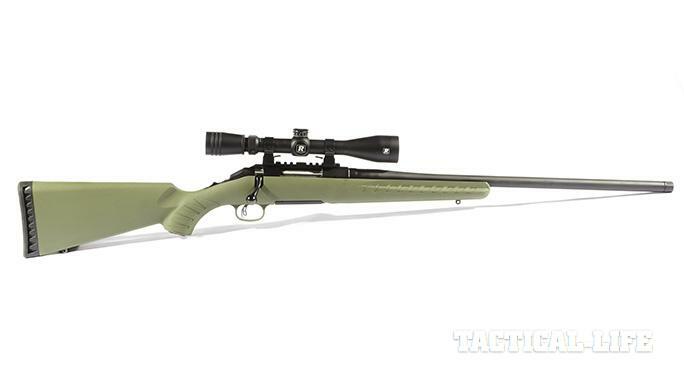 If you’re a SWAT officer or long-range hunter, it would be nice if you could get an accurate bolt-action rifle that weighed 6.6 pounds or less in a flat-shooting caliber, such as the 6.5 Creedmoor, for less than $550. Just another pipe dream? Not really. 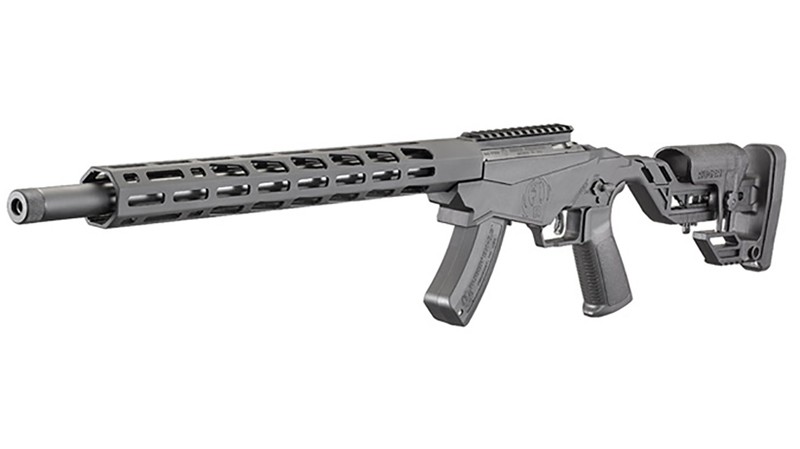 Sturm, Ruger & Company recently introduced such a gun—the Ruger American Predator. 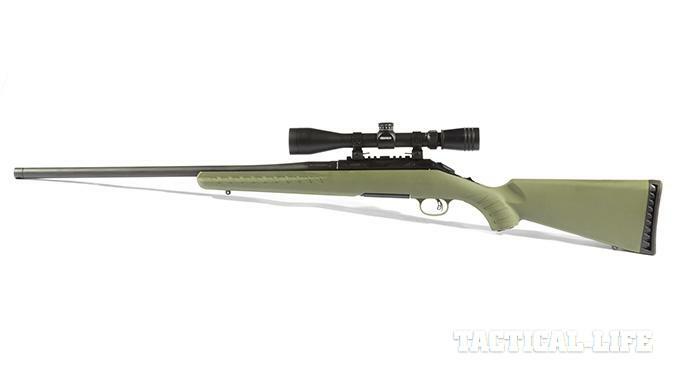 The Ruger American Predator is an offshoot of the popular Ruger American Rifle, which was introduced a few years ago. 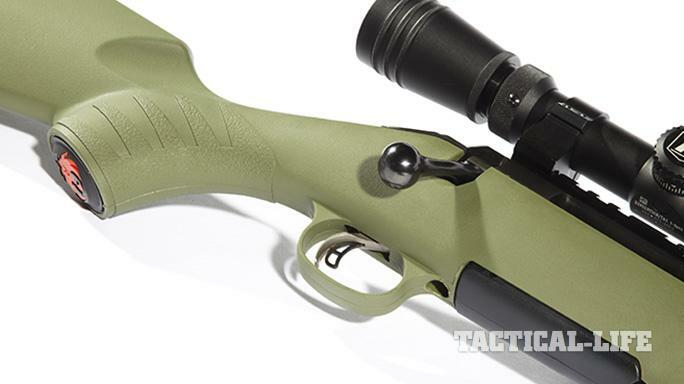 This rifle was designed to be accurate, practical and affordable. The American Rifle also produced very good groups and gained a reputation for obtaining 1-MOA accuracy. Not all precision rifles I’ve shot can make that claim. Many do, but why pay more for essentially the same result? The 6.5 Creedmoor Predator’s ability to shoot small groups comes from its accuracy-enhancing features. The first is a crisp adjustable trigger that breaks cleanly and can be set at 3 to 5 pounds. 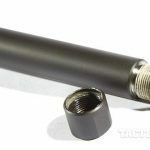 Its 22-inch barrel is precisely hammer forged, and it has a profile that’s somewhat on the heavy side, measuring 1.15 inches in diameter at the receiver and 0.745 inches just before the threads at the muzzle. This gives it sufficient rigidity to dampen group-enlarging barrel whip and limit shifts in the point of impact because of heating when you quickly fire several shots in succession. The muzzle sports the popular 5/8×24-tpi threading so you can mount a muzzle brake or sound suppressor. And there’s the lightweight polymer stock with Power Bedding, composed of two steel bedding blocks that fix the location of the receiver in the stock. In addition, the barrel floats freely above the forend, which has a molded polymer internal honeycomb reinforcement. 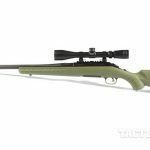 Combine all of this with a well-executed overall matte finish and an integral Picatinny scope rail, and the result is a rifle designed for accuracy from the get-go. It’s good to have desirable features, but a precision rifle must be made well. 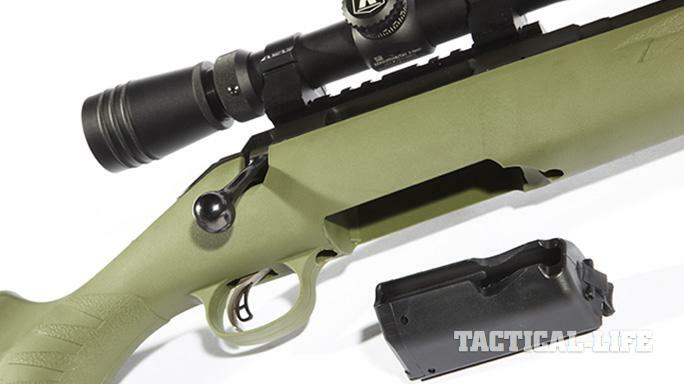 When field-stripped and examined at the bench, my test Ruger American Predator rifle showed no tool marks, scratches, poorly conformed parts, sharp or crooked edges, or blemishes in the finish. After cleaning, the bore appeared bright and shiny, with no obvious imperfections. The bolt was a bit stiff on cocking but it smoothed out with time and use. A small amount of TW-25b grease on the bolt lugs also helped in this regard. The rifle’s adjustable trigger was easy to set at 3 pounds, after which I remounted the stock and torqued the guard screws to exactly 60 inch-pounds. 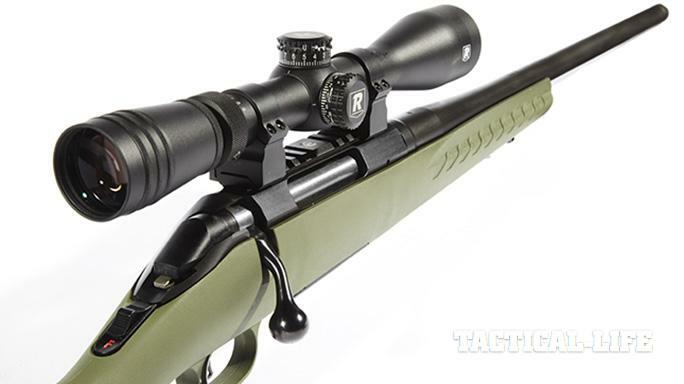 A rifle designed for pinpoint precision deserves a target-quality scope. 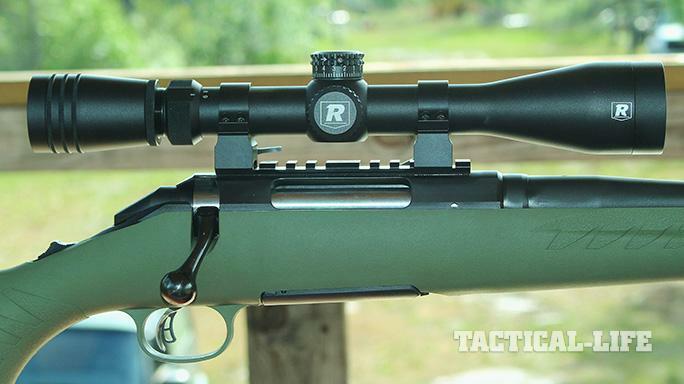 And because the Ruger American Predator is relatively inexpensive, the scope should be, too. 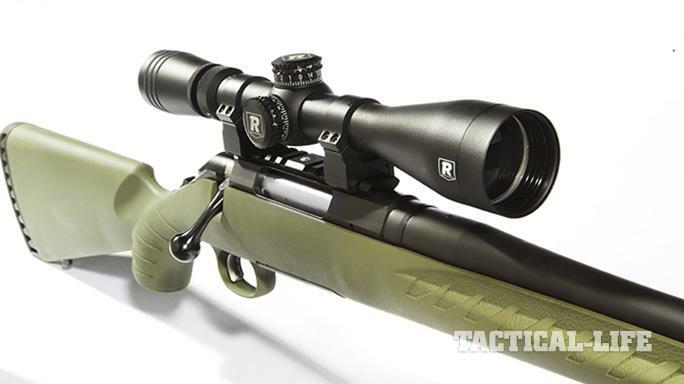 Fortunately, Redfield makes a good tactical scope for about $350—the 3-9x40mm Revolution/TAC. 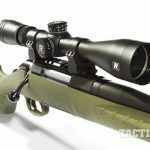 For a relatively inexpensive tactical scope, the Revolution/TAC has several features that make it attractive to people seeking a precise, compact and relatively lightweight scope to pair with the Predator. This nitrogen-filled, water-, shock- and fogproof scope has premium lenses that are fully multicoated using Redfield’s exclusive vapor-deposit technology. 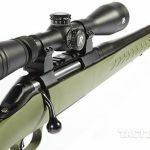 Even though it’s slightly longer than a foot and only weighs slightly more than 12 ounces, the scope’s top-end magnification will easily allow hits out to 600 yards by just holding over and sighting with the riflescope’s effective TAC-MOA reticle. If you need longer shots, you can use the scope’s target-style turrets to increase elevation. The total amount of vertical and horizontal adjustment is 56 MOA, which is enough to make shots possible at 1,000 yards if the visual axis of the scope is properly aligned with the axis of the bore through lapping the scope rings or by using adjustable rings and/or bases. 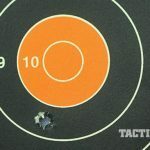 The 6.5 Creedmoor can neutralize a hostile target at longer distances, but law enforcement marksmen rarely shoot beyond 200 yards, and even long-range hunters generally keep their shots within 600 yards. 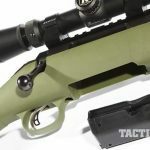 After mounting the scope in Leupold quick-release rings, the entire package weighed a little more than 7.5 pounds with a loaded magazine. The 6.5 Creedmoor cartridge was designed by Hornady ballistics engineers in 2007. The concept was to develop a highly efficient 6.5mm cartridge that would rival the .260 Remington in powder capacity but better accommodate long bullets in a short-action rifle. To accomplish that, they based the 6.5 Creedmoor cartridge on the .30 Thompson/Center cartridge rather than the .308 Winchester case. 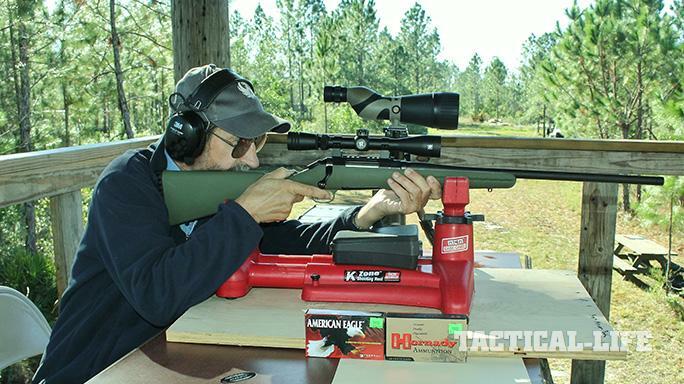 Initially, the 6.5 Creedmoor’s ballistics don’t look like those of a long-distance cartridge. For the 140-grain Federal American Eagle Open-Tip Match (OTM) round, the advertised muzzle velocity is 2,700 fps compared to 2,600 fps for a .308 Winchester with a 180-grain bullet. The key to the 6.5 Creedmoor’s success at long-distance shooting is its high ballistic coefficient (BC), especially when using Hornady’s new 143-grain ELD-X bullet. The ELD-X has an extremely high G1 BC of 0.624. I’ve seen a custom 6.5 Creedmoor rifle with a 12X scope use this ammo to engage targets to 1,200 yards. At that distance, the ELD-X is 488 inches low while the 180-grain .308 Winchester is 639 inches low—a difference of 151 inches in trajectory for bullets that only started with a difference of 100 fps in muzzle velocity. 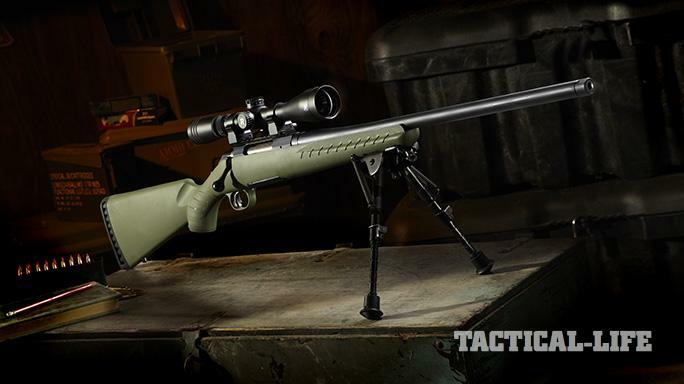 The 6.5 Creedmoor also beats the .308 Winchester handily at long-range terminal ballistics. 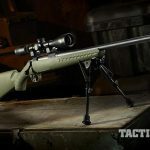 At 500 yards, the Creedmoor retains more bullet energy than the .308, even though the .308 delivered almost 300 more foot-pounds of energy (fpe) at the muzzle. 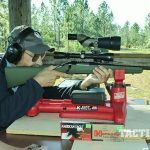 I tested the rifle and scope for accuracy and velocity at the Big 3 East Training Center near Daytona Beach, Florida. Thankfully, the weather was clear and cool. The bad news was that later in the morning the wind gusted to about 8 mph, and that was during the long-distance portion of the evaluation. The wind opened the groups a bit, but hunters and marksmen can’t always expect perfect conditions. Two loads were available for testing: Hornady’s 120-grain A-MAX rounds and Federal’s American Eagle 140-grain OTMs. To measure the rifle’s accuracy, I fired three 3-shot groups at 100 yards and subsequent three-shot groups at 200 and 300 yards. I used Sierra’s Infinity Ballistic program to compute holdover and windage corrections. I fired three-shot groups because hunters and law enforcement marksmen rarely fire more than three rounds consecutively. On the other hand, they might have to fire several rounds in quick succession. Therefore, each three-shot group was fired within a minute instead of letting the rifle cool a minute between shots and five minutes between groups, which is my usual practice when testing a weapon’s accuracy. The Federal load was the most accurate with a best group measuring 0.9 inches. The Hornady load wasn’t far behind with a 0.95-inch best group, establishing the fact that the Predator is a sub-MOA rifle. 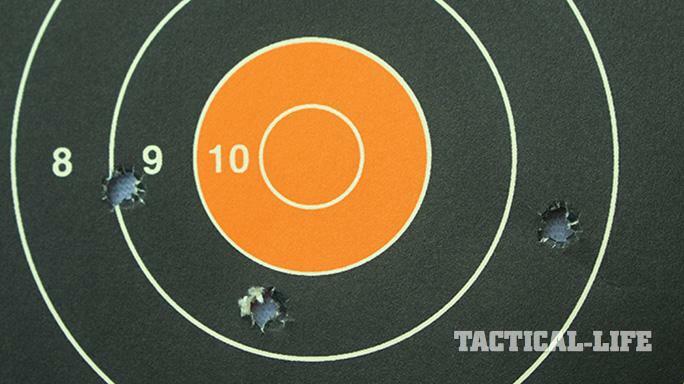 None of the 100-yard groups were larger than 1.5 inches, and three of the six groups were less than 1 MOA. Clearly, the rifle has some potential. At 200 yards, the Hornady load shot into 2.75 inches, and the Federal Eagle shot into 3 inches. 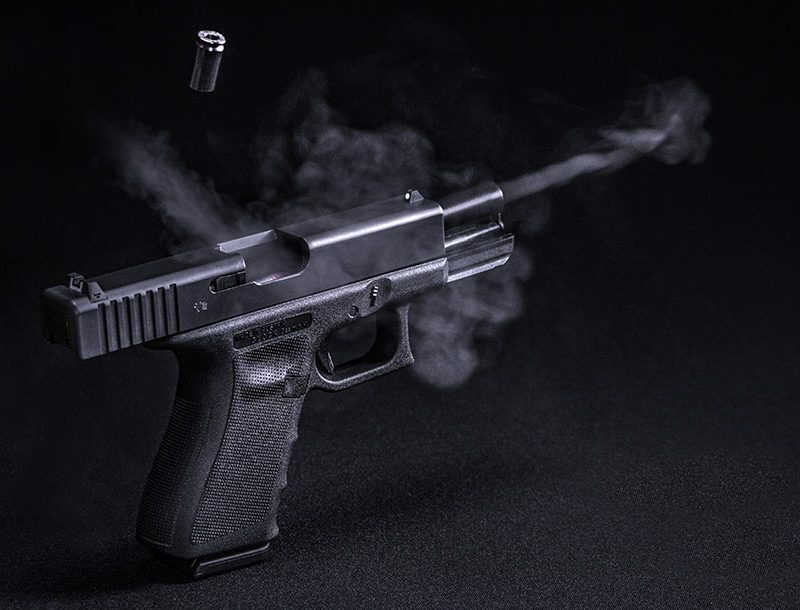 Both groups showed the effect of the wind blowing at a 90-degree angle to the bullet’s flight. At 300 yards, the Sierra ballistics program indicated the drop would be about 2.2 inches for the 120-grain load and 2.8 inches for the 140-grainers, provided the bullets traveled at the advertised velocity. I used the Hornady load for this test. Because its velocity was more than 100-fps slower than advertised, I aimed two shots 4-MOA high and one shot 5-MOA high above the center of the 10-zone in the middle of the chest. The two-shot string struck the upper chest about 3 inches above the point of aim. The third (5-MOA hold) shot was in the area of the left carotid artery, 7 inches above the point of aim. Unfortunately, my time and ammunition were limited, as I would like to have spent another morning working the trajectory out to 600 yards. I measured the velocities using a Competition Electronics ProChrono chronograph. The Hornady load averaged 2,780 fps from the rifle’s 22-inch barrel and produced 2,058 fpe at the muzzle. The Federal load averaged 2,627 fps and produced 2,145 fpe at the muzzle. Those muzzle energies might seem a bit low at first, but the BC of the 140-grain bullet retains velocity and energy well, giving the 6.5 Creedmoor the capacity to cleanly down a deer at 500 yards—a distance at which the bullet is still moving at almost 1,900 fps. 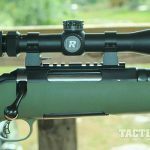 Teaming the Ruger American Predator with Redfield’s Revolution/TAC scope clearly demonstrated that long-range hunters and law enforcement agencies don’t have to spend big bucks to get a good precision rifle. 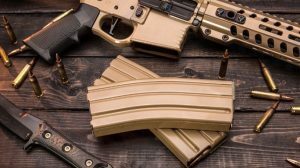 Even if they pay full retail price, they can still put the rifle/scope combination tested for this article into the field for less than $1,000. That’s good news for taxpayers and hunters on limited incomes. 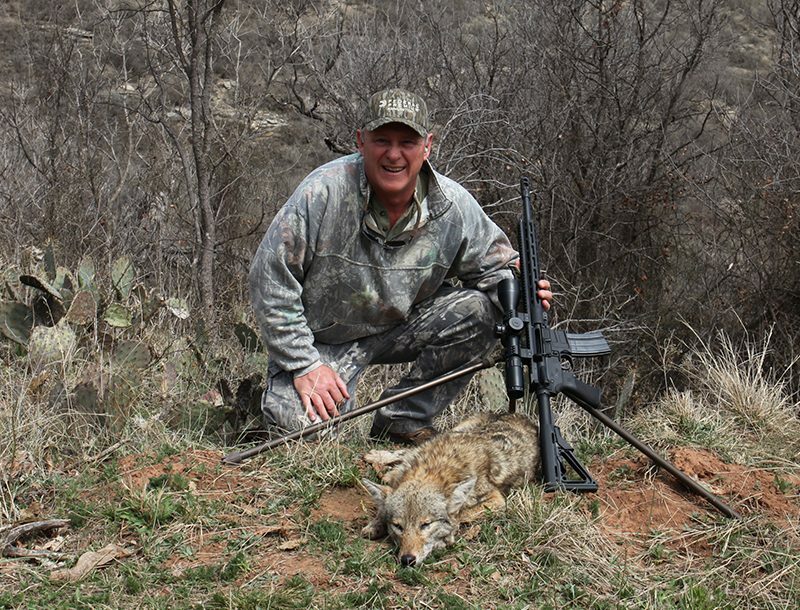 For more information about the Ruger American Predator, visit ruger.com.